This month we’re highlighting Norman Nelson, founder of MINI Thunder. Together with Eric Diamond and their wives Jesse and Lisa, they organize an annual MINI only track day event at Thunderhill Raceway- Stormin Norman’s MINI Thunder. Norman is an avid Mini Cooper enthusiast and a member of many clubs. He is active in the MINI community and previously raced with SCCA for about 10 years. He’s retired from the large industrial diesel engine business and now spends his time traveling and enjoying life. He is married and has four sons. MSR: What types of events do you run? Norman: Once a year we offer a track day event at Thunderhill Raceway called Stormin Norman’s MINI Thunder. It includes an HPDE with coaches and allows a lot of spectators to come out and see what it’s all about. In addition to our track day, our club Shasta MINIs, does many events during the year including car shows, parades, and tours of the coast and mountains. MSR: What makes your organization unique? 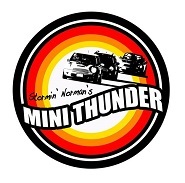 Norman: We offer the MINI Thunder event to MINI Coopers only and it has become the largest and BEST event in the nation. We attract enthusiasts from New Mexico to Washington State. Most other track events allow other brands of cars, but we have built this into a well-known and well- run event that everyone enjoys and leaves with a smile on their face. MSR: What is your club really good at? Norman: Promotion, great coaches, organization, safety, and offering a good time. MSR: Tell us a little bit more about your promotion strategy and what works for best for you? Norman: Well I target a specific market, MINI Coopers, so it may be a bit easier than trying to attract an open market. I use Facebook a lot. It seems to be the best for getting the word out, but you need to work at it and build up a friend base. My friend base is nearly 3,600 people and most are MINI Cooper enthusiasts. I also target several of the major MINI Facebook pages like MINI USA who has nearly 500,000 followers and then MINI Motorsport and others. I have also gained the trust and support of MINI USA so they post stuff about our events. I have joined many of the MINI Clubs and post on their websites. There are a handful of MINI specific forums pages and I am active on them as well. I also use radio and TV (Miniology.com), newspapers and mass emailing to promote my events. MSR: Sounds like a lot of work! Norman: It's a passion for me so it really isn't that much work. Norman: I love racing and MINI Coopers, and track day events combine both. It enables us to share the experience with many of our MINI Cooper friends. Running an HPDE allows beginners through experts to enjoy a common passion. Norman: They are a lot of work, lots of planning, but very rewarding. MSR: What’s next for your club? Norman: We have our MINI Thunder V coming up in February 2014. We are excited as we have our sponsors on board and are already getting registrations. With the new expansion of Thunderhill we see our ability to continue to build upon our event. MSR: How has using MotorsportReg.com impacted your events? Norman: You guys ROCK! You make it possible to manage the event. We are a small group and we rely on your ability to handle all of the money and registrations, and provide us with the tools to make name tags, group lists, check lists,and handle waivers. Plus the email blaster allows us to send out information and updates through group emails to all of the entrants. One of my favorite features is your customer service! You guys respond quickly and will find ways to solve any problem. MSR: Norman thanks for chatting with us! MINI Thunder V is an HPDE held at Thunderhill Raceway Park, Willows, CA on February 16, 2014. It is broken up into Beginner, Intermediate, Advance, and Race Prep/ Coaches. Each group gets five 20-minute track sessions followed by a 20 minute classroom session. All beginners go out with coaches in their cars and they have nearly 50 experienced and qualified coaches to handle all the groups. Students are taught the techniques for driving a MINI on the racetrack, the apexes, braking points, set up, exits, etc. The event is supported with turn workers, grid control, tow trucks, emergency vehicles, medical, communications, flagging etc. Last year this event had over 200 MINIs on track and each year the number grows. Drop by the registration page and Facebook page for more details on this awesome event!